It's not common by any stretch, but flesh-eating bacteria is quick to spread and can be fatal. If you have any symptoms of this condition, seek medical help immediately. The flesh-eating bacteria is a member of group A streptococcus, the same bacteria that causes strep throat. Flesh-eating bacteria—also known as necrotizing fasciitis—is a quick-spreading, aggressive infection that can be fatal if not treated promptly. The infection starts below the skin and spreads along the fascia (the flat layers of tissue that separate other tissues, including muscles, fat, and organs), destroying these tissues as it spreads through the body. Flesh-eating bacteria most commonly attacks the arms, legs, and abdominal wall. According to the Centers for Disease Control and Prevention, group A streptococcus is most commonly to blame for necrotizing fasciitis, causing between 700 and 1,200 cases in the U.S. each year, although the actual number is likely higher. How Common Is Flesh-Eating Bacteria? Not very. “Flesh-eating bacterial infections are relatively uncommon, but not so uncommon that they are rare,” says Dr. Amesh Adalja, Senior Scholar at Johns Hopkins Center for Health Security and spokesperson for the Infectious Diseases Society of America (IDSA). That said, those with a strong immune system and good hygiene practices (including proper wound care) are unlikely to become infected with flesh-eating bacteria. Those with weakened immunity (e.g., alcoholics or people with diabetes, kidney or liver disease, or cancer) are at a higher risk of infection. The bacteria most commonly to blame for flesh-eating bacteria is a member of group A streptococcus (GAS). Sound familiar? That’s because it’s the same bacteria known to cause strep throat. Like any bacteria, necrotizing fasciitis can enter the body through an open wound (e.g., from an injury or surgery). It can also spread through small cuts, insect bites, and minor abrasions. 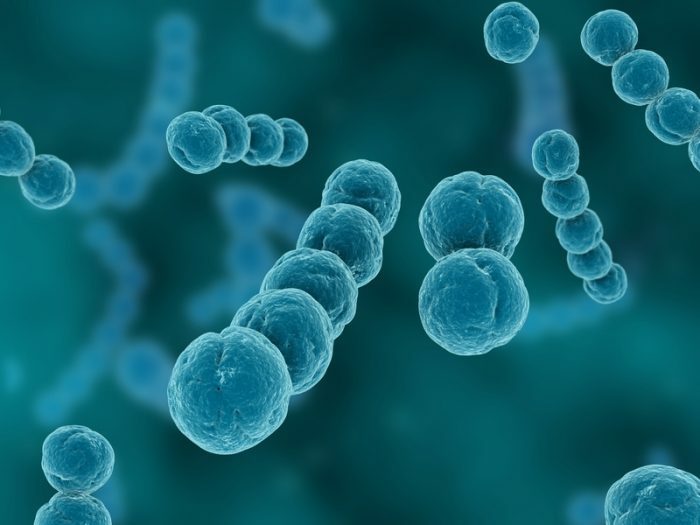 The most common way to spread flesh-eating bacteria is through a break in the skin—through, for example, a bug bite, surgical wound, cut, scrape, or burn. Since symptoms of necrotizing fasciitis may start off mild—mimicking the flu, for instance, with nausea and fever—many don’t seek help right away. Sometimes, the injury through which the bacteria entered is mild, perhaps not even breaking the skin. Due to the rapid nature of this potentially fatal infection, quick diagnosis and treatment is key. The Centers suggests heading to a doctor if you experience fever, dizziness, or nausea shortly after an injury or surgery. The most important treatment for necrotizing fasciitis is to get help quickly. According to Dr. Adalja, treatment includes both antibiotics and surgery. A doctor will determine the severity of the case and prescribe an appropriate course of action to resolve the condition. CAN YOU PREVENT FLESH-EATING BACTERIA? Clean all minor cuts and injuries (i.e. scrapes and blisters) with soap and water. Cover the open wound with a clean, dry bandage until it heals. Avoid hot tubs, swimming pools, and other bodies of water (e.g. ponds, lakes, rivers, and oceans). antibiotic therapy, antibiotics, bacteria, blood pressure, blood pressure medications, cancer, dehydration, diabetes, diarrhea, dizziness, e coli, flu, flu like symptoms, health, immune system, immunity, infection, inflammation, liver disease, mrsa, oxygen therapy, pain, pain management, people with diabetes, severe pain, skin, staph infection, supplements, supplements for inflammation, ulcers. My daughter had just such an episode which, unknown at time, began with a bout of strep throat………….. the beat red hot area on her leg rapidly increased where she was ultimately hospitalized for a week & it was only when a dermatologist diagnosed it to be what you have described. A very scary situation for sure. Thank you for this article.